Rex is the perfect little puppy to keep your baby company. His fur is a distressed caramel color with charcoal and tan striped pads and lined ears. 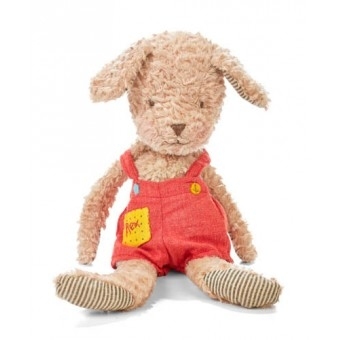 His red cotton overalls with yellow and dotted pocket with his name embroidered on it will quickly become a favorite buddy to snooze with. 12 Inches Tall and can be spot cleaned.